Born in 1716, Aaron Burr Sr. enjoyed all “the advantages of birth, breeding, and education” and “sufficient wealth.” Burr attended Yale College in Connecticut and, after graduating in 1735, served as a pastor for the Presbyterian congregation in Elizabethtown, New Jersey. Burr was a “New Light” minister of the Presbyterian Church, embracing the religious revivals of the Great Awakening in opposition to more conservative “Old Light” ministers. His skills as a preacher and scholar earned him a reputation as one of the leading figures of the movement. And in 1746, Burr partnered with three like-minded ministers to establish the College of New Jersey, a school where religious dissenters like the “New Lights” could receive an education while freely practicing their beliefs. Jonathan Dickinson, also one of the college’s four founding trustees, was appointed the college’s first president in 1747. Dickinson’s tenure was cut short, however, when he died just one year after assuming the presidency. Upon Dickinson’s passing, the Governor of New Jersey, college trustees, and sundry clergy members assembled in Newark to select a new president, unanimously electing Burr. Just thirty-two years old when he succeeded Dickinson, Burr remains the youngest president in Princeton’s history. In the first eight years of Burr’s presidency, the College of New Jersey lacked infrastructure: Burr held classes in his Newark parsonage, and some students boarded at the Burr family home. In 1756, however, Burr oversaw the college’s move to its new Princeton campus—which at the time consisted only of Nassau Hall (built on land donated by a wealthy slaveholder), and the President’s House. The college expanded dramatically under Burr’s tenure, with the student body increasing tenfold by 1757. The future Princeton University had grown from a single teacher and a “handful of students” to a permanent campus with three teachers and approximately seventy pupils. Burr balanced a host of disparate responsibilities in order to achieve such marked growth. He was, at once, a “president, professor, secretary, librarian, [and] purchasing agent” for the college. Burr was instrumental in designing the college’s regulations, entrance requirements, and curriculum, and he personally taught mathematics, languages, and surveying. As a minister, Burr also preached and led religious events on campus, including a day of fasting and prayer during the French and Indian War. Furthermore, Burr forfeited a salary for the first three years of his presidency in order to ease some of the college’s early financial strains. But in 1756, the same year Burr delivered this sermon and relocated the college to Princeton, he also purchased an enslaved man. When Burr and his family moved into the President’s House, they likely brought this man—Caesar, purchased for eighty pounds from New Yorker John Livingston—with them. Caesar would have lived in the slave quarters on the second floor of the detached “Kitchen House” adjacent to the main residence. Campus legend suggests that Burr had a covered passage constructed between the kitchen and the main house in order to prevent “severe cooling of man or meal” when Caesar carried food to the Burr family. 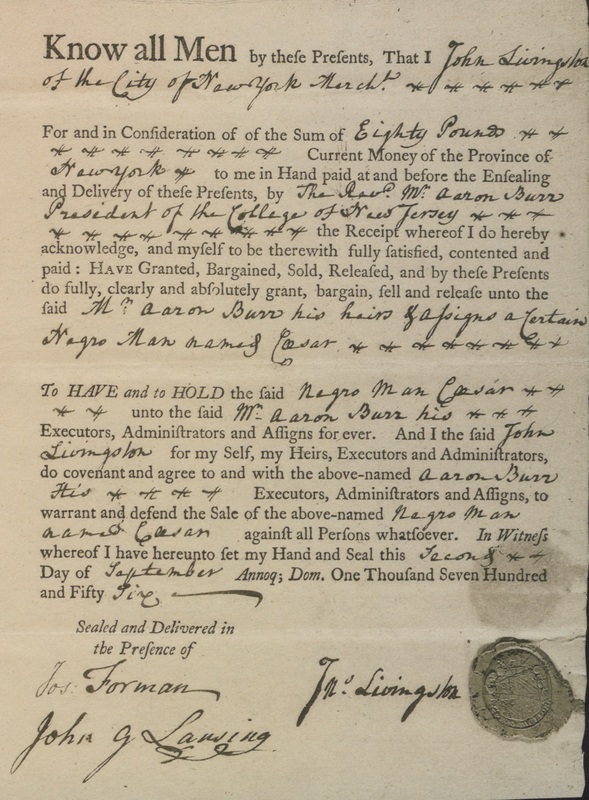 Bill of sale for Caesar, an enslaved man Aaron Burr Sr. purchased in 1756. Ceasar was not Burr’s only slave, however. When Burr died in office in 1757, he left a will that listed three enslaved people assessed at a monetary value of 150 pounds. One of these would have been Caesar, and a second was likely the man named Harry whom Burr’s mother-in-law expressed interest in buying after Burr’s death. The name of the third remains unknown. The first president to reside at the President’s House, Aaron Burr Sr. was also the first to bring enslaved people to the Princeton campus. And while Burr worked tirelessly to establish the college as an educational institution where young men could freely practice their beliefs, his endeavor relied on the tireless and often-forgotten labor of these enslaved people. Shelby Lohr is a doctoral student in Princeton's history department. Her work links book history, marginality, and politics in nineteenth century America. Before beginning her Ph.D., Shelby ran a literacy program for preschoolers in Chicago's South Side. She received an M.A. from the University of Chicago and a B.A. from Georgia State University. Thomas Jefferson Wertenbaker, Princeton, 1746-1896 (Princeton, NJ: Princeton University Press, 2014), 42. Charles Burr Todd, A General History of the Burr Family, With a Genealogical Record From 1193 to 1891 (New York: Burr Todd, 1891), 46. “Aaron Burr Sr.,” The Presidents of Princeton University, accessed 21 July 2017, https://www.princeton.edu/pub/presidents/burr/. The Boston Gazette, 21 April 1755. “Aaron Burr Sr.,” The Presidents of Princeton University. Bill of Sale for Caesar reproduced in Milton Meltzer, Slavery: A World History (Boston: Da Capo, 1993). “Rev. Aaron Burr,” New Jersey, Calendar of Wills, 1670-1760, accessed 21 July 2017, www.ancestry.com. 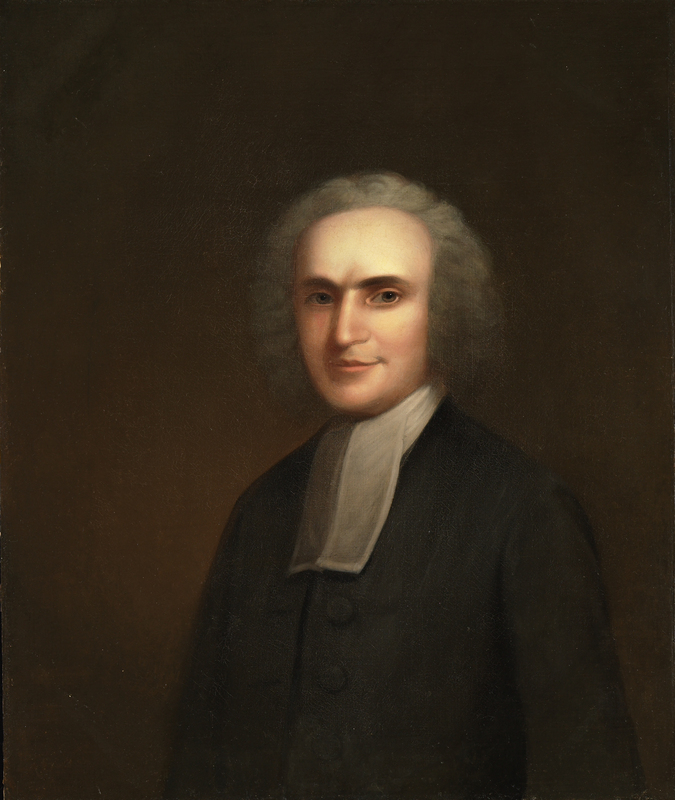 Kenneth P. Minkema, “Jonathan Edwards’s Defense of Slavery,”Massachusetts Historical Society, Vol. 4, Race and Slavery (2002), 43.